Located in the historic Perili Köşk (Haunted Mansion), the Borusan Contemporary gallery in Istanbul stands out for its vast collection of contemporary artists who lay bare the latest movements and developments in contemporary art. The gallery is currently holding a temporary exhibition titled "Deck Voyage," which aims to use the temporary exhibition venue of the art gallery to explore art's attitude towards contemporary phenomena. Visitors will be able to observe new media art along with new additions to Borusan Contemporary, as "Deck Voyage" is being held in tandem with the permanent contemporary art. The exhibition's main objective is to bring contemporary art from different disciplines together, while making reference to the contrasts between the inner world of the individual and the life we live. What distinguishes contemporary art from the modern or previous classic era is the "open-endedness" that appeals to the sensory and perceptive realms of the audiences. New media art, above all, introduces the concept of the "moving image." Since the Borusan Contemporary Art Collection is especially fostered by new media art that presents images, sounds and art forms that glide through each other, "Deck Voyage" aims to develop a perspective that is compatible with this essential quality. The exhibition is curated by Necmi Sönmez and inspired by the novel, "Yaşamın Ucuna Yolculuk" (A Journey to the Edge of Life), written by Tezer Özlü (1943–1986) who is considered as one of the most important representatives of Turkish Literature. "Deck Voyage" uses every piece of blank space in Perili Köşk and turns these places into an exhibition venue. When the audience steps outside of the exhibition venue and arrives at the elevator, they are welcomed by artist François Morellet's outstanding neon light work. Morellet artwork brings together canvas painting and neon wall installations, creating small differences in perception by tricking the eye. Two square forms look as if they were placed on top of each other pose a contrast to red neon pipes, which can be read as a dialogue between two geometrical forms such as a square and a triangle. Morellet, an artist who frees geometry from its repetitive and monotonous nature and opens the door to irony, also uses angles and ratios as is evident in the work's title, "Neons 3D: 60°90°35°." Wang Sishun's video installation located near the Borusan Contemporary's staircase references the main concept of the permanent collection – "the moving image." 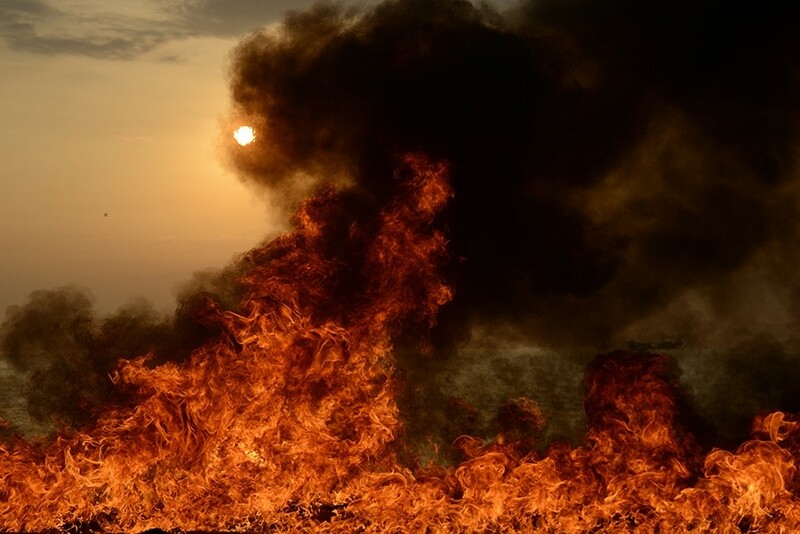 The artist carries a small fire in his car while traveling from Beijing to Shanghai and films the fire in front of different landscapes en route. No one really knows how he actually carries the fire in his car or how he makes the fire grow while he is filming. One thing is clear though: the artist did not manipulate the video in any way and the flame is real. This "fire" also references artworks displayed on the third floor of Borusan Contemporary. While fire is something the gods keep to themselves in Greek mythology, in Chinese mythology it is a symbol of the permanency of life. The third floor starts with the fire lit by a Chinese artist and continues with German photographer Frank Thiel's large-scale Patagonia photographs. The fourth floor of Borusan Contemporary is dedicated to photographs and video installations displayed as a part of the "Deck Voyage" exhibition. All the photographs and video installations feature the "subjective worlds" of the artists, who come from different cultures and generations. Depicting a figure who tries to escape from a metal ball that represents the world, the video by Greek artist Kalliopi Lemos portrays a search for freedom, regardless of era or culture. Engin Beyaz's installation composed of transparent beehive shapes tells the stories of small people who look like they do not struggle to exist in this harsh world. Finnish artist Ola Kolehmainen's large scale photograph deceives the audience with its colors that at first glance seem misplaced. When observed closely, the audience realizes that these are surfaces with sunlight reflecting on them. This realization also comes with a series of questions such as, "What can this detail be a part of?" or "Do the colors mean anything?" The answers to these questions are the keys to unlock Kolehmainen's subjective world. The subjective world that American artist Ben Rubin created with a total of 36 LED fluorescent lights reveals his subjective world in six-letter words. 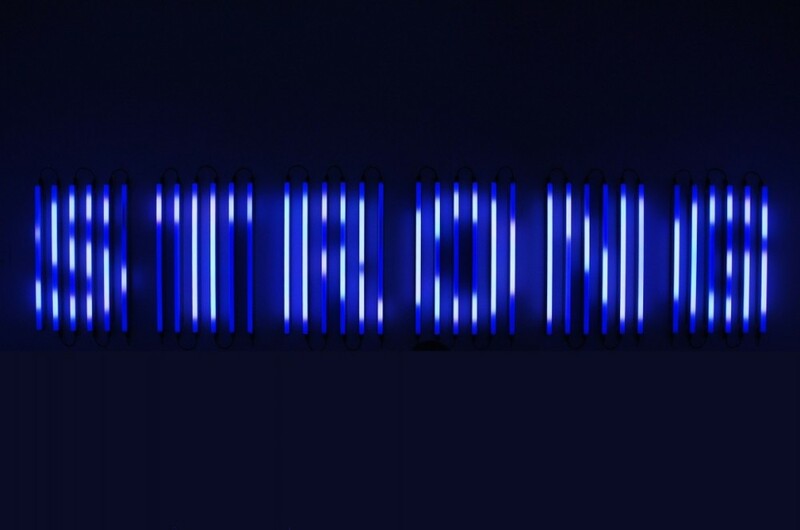 Placed vertically on the wall, six fluorescent LED tubes each form a letter and are programmed by the artist to repeat words that are frequently seen in the Wikileaks documents such as strong, names, places, etc. Moving up another floor at Borusan Contemporary, American artist Jesse Fleming's video about a dialogue between a snail and a razor blade welcomes art lovers. Impressive from beginning to the end, other artwork on this floor by Merve Şendil, Lee Sang Hyun and Gerwald Rockenschaub also make references to current world problems with allegorical narrations. The common feature that all the artists in this section share despite their varying disciplines, is the references they make. The figure seen in Burçak Konukman's video is the artist; she refers to the relationship between the artist and the institutions in the "art machine." Ellen Kooi's tall, thin figure of a woman who stands in the middle of a seemingly endless road can be construed as the individual's struggle for freedom. Ruby Anemic's impressive line advises us to move forward and be persistent against all odds. These works reveal how different artists from different cultures and generations perceive each other through different media. Another thing that can be observed in contemporary art practice is simultaneous and fearless experimentation. Regarding all the installations situated at the fifth floor of the Perili Köşk, it can be said that the floor is a brief summary of the entire Borusan Contemporary Art Collection. The video installation of Hong Kong based artist Kwan Sheung Chi, featuring the artist trying to drink a whole cup of coffee with a fork and the photograph of the Dutch artist Ellen Kooi, featuring a woman by the lake who is trying to hide her face, give the audience a sense of everyday life. In the entire Borusan Contemporary Art Collection, plain images belonging to everyday life is a recurrent theme. Situated right by the second bridge, two different sized terraces enchant visitors with their panoramic view of Istanbul. Stretching from East to West, these two terraces accommodate works of Ekrem Yalçındağ, Andrew Rogers and Beat Zoderer. While Yalçındağ creates a spatial atmosphere in the little tower with different shades of brown, Rogers and Zoderer's sculptures intrigue passers-by with their colorful forms. Allard van Hoorn's installation, on the other hand, invites the visitors to a journey using the sounds of waves, which have been the symbol of the Bosporus for centuries.